…or Third Time’s The Charm!! Look at that beautiful pizza pie!! Some of you may remember my first attempt at New York Style Pizza. Didn’t quite go as well as planned, namely due to an oversight on my part. All purpose flour is NOT the same as bread flour, just so ya know. So what about the second attempt? Well, that one never got documented (although I’m sure I have pictures floating around somewhere). When letting my Egg come up to temperature, the plate setter (which had gone through several low and slow cooks with nothing to protect it from drippings) literally caught on FIRE!! I wish I had pictures of that part. So we had to resort to the oven. That and I took the amount of dough for one pizza and tried to stretch it out for two. Ended up overworking the dough while forming the crusts. While it still tasted good, the extra stretching and overwork caused it to be thin and flat and had no rise when cooked. But the third time…well the third time was the charm! 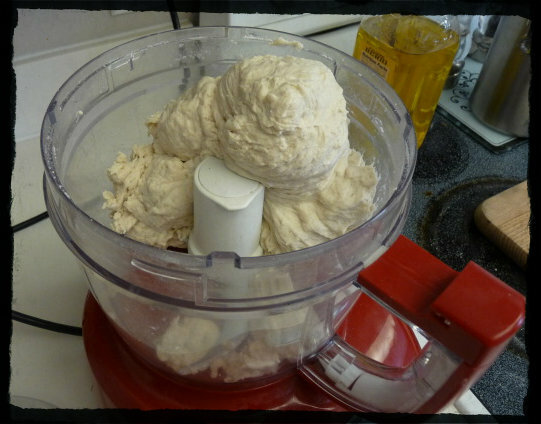 Remember this recipe called for the dough to be mixed in a food processor? 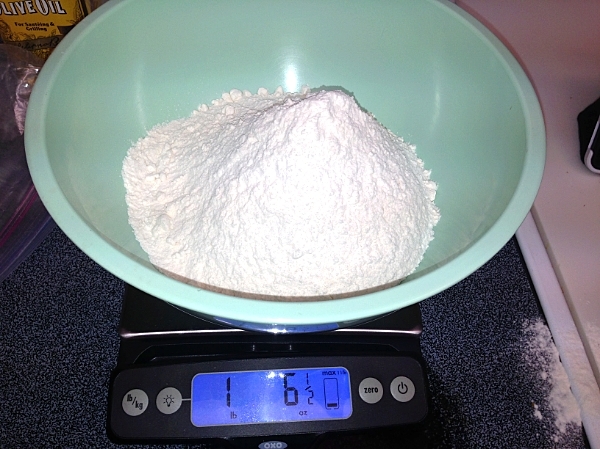 Combine flour, sugar, salt, and yeast in bowl of food processor. Pulse 3 to 4 times until incorporated. Add olive oil and water. Run food processor until mixture forms a ball that rides around the bowl above the blade, about 15 seconds. Continue processing 15 seconds longer. Kenji didn’t mention anything about “docking” his pizza dough. I worked in numerous pizza joints in high school and college. In some, we “docked” the dough, in others we didn’t. 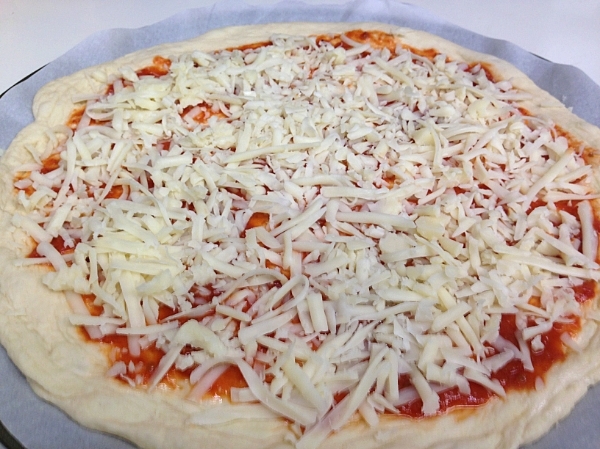 Basically, its poking holes in it to prevent bubbles from forming when cooking the pizza. Where I worked, we had a roller that did it, now at home I just use a fork. We’ve discussed it before, but I’ll mention it again. Please grate your own mozzarella. Do NOT use the pre-grated stuff. It’s coated with “stuff” to prevent it from clumping in the bag…which also prevents it from melting nicely. And not part-skim or low-fat, get the full fat stuff. The other kinds don’t give you that stretch when you take a bite. Come on people, it’s pizza! Live a little. You’re already cheating on your diet, might as well go all the way. One last thing, don’t use the fresh or buffalo mozzarella. This isn’t a Neapolitan pizza, its NY Style. Save that for a pizza Margherita pizza. All that hard work pays off. Ovens vary and cooking times will be different for everybody. Kenji suggests 12-15 minutes. 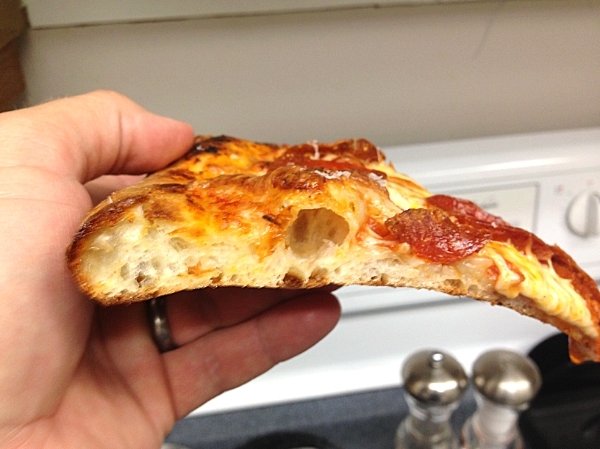 I slid my pizza in the oven on my pizza stone that had been warming for one hour using the parchment paper trick. After 5 minutes, I opened the oven, slid the parchment paper out from under my pizza and gave it a 90 degree spin. Reset the timer for another 5 minutes. When it went off, I brushed some melted garlic butter on the edges of the crust and gave it another spin, almost done. Keeping an eye on it, I let it go another 2 to 3 minutes and it was done. 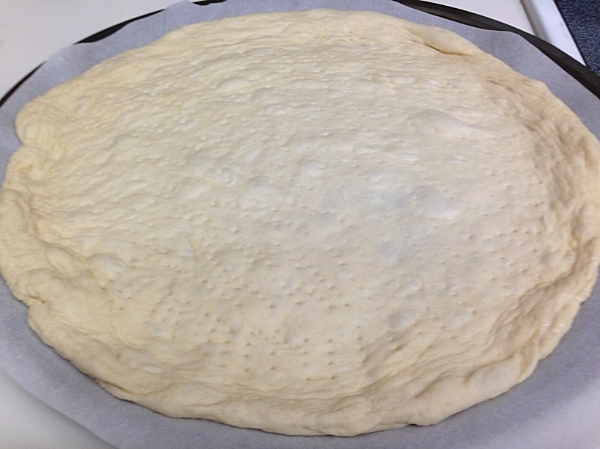 This dough requires a night in the fridge before its ready to use. Not saying that it’s not good the next day, but try leaving it for 2-4 days. The dough will have even more flavor. 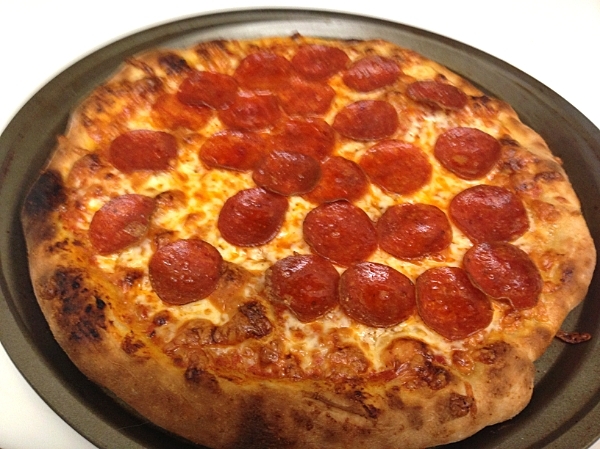 Life gets in the way and for whatever reason you aren’t able to make your pizza in 5 days? Vacuum seal it and pop it in the freezer for another day. Whenever you are ready, take it out of the freezer the night before and allow it to thaw overnight in the fridge. The next day, let it rise at room temp for at least 2 hours (I went for about 3.5 hours) and it will come out just fine. That exactly what I did with this one. The sauce also freezes just fine. Please allow at least one hour for your pizza stone to come up to 500F. It will benefit you when cooking pizzas. 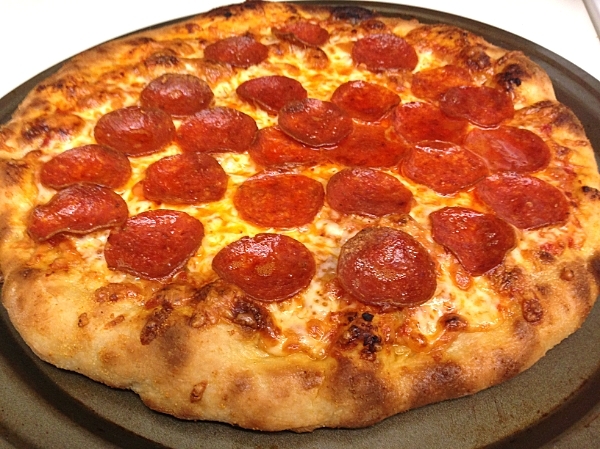 Do you find pepperoni to be too greasy? Pop it in the microwave for 15-20 seconds and then blot away the grease with a paper towel. Looks yummy, and being ffom NJ and missing pizza very much where I am I must try this. Give it a shot and let me know how you think it compares. Wow! This is awesome. I bet the fire was pretty scary. I hate to see flames around my cooking equipment. Gorgeous! I wish I could have been a fly on the wall when the platter caught fire. At least nothing was damaged (right?). That third pizza was definitely the charm it looks amazing. I’m from NY and this looks awesome – going to try it as I no longer live there. Thanks! Thanks. Where you been hiding? I’ve been around–just made a post yesterday about dry aged Waygu burnt ends. 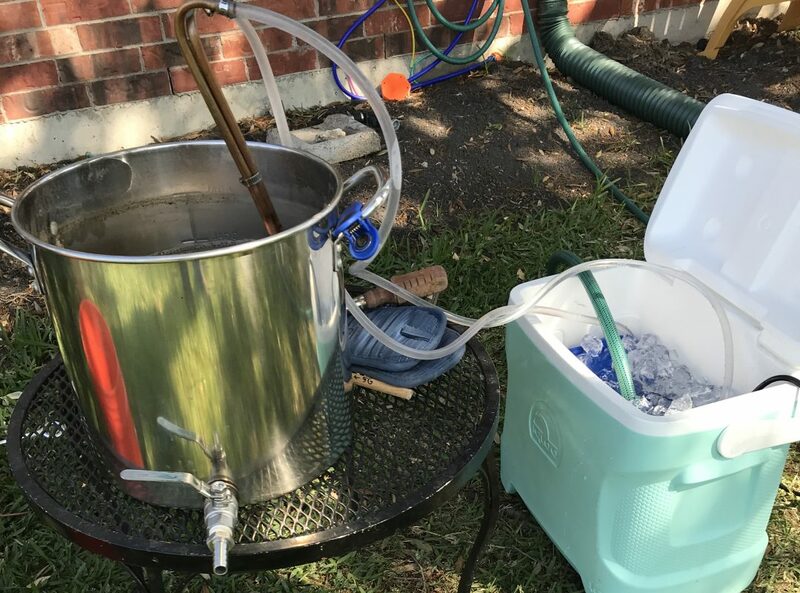 Life has gotten a little hectic, so I’ve been slow about getting my adventures in cooking and BBQ up on the blog. I have some other cooks that I will get around to posting at some point. I saw that. Those looked crazy good and the people at the office sure seemed like they enjoyed them. This New York style pizza looks to die for! Thanks for posting it on foodieportal.com.